GM Li Chao b overcame the challenge from FM Lim Yee Weng to forge ahead with a 1 point lead at 8 1/2. 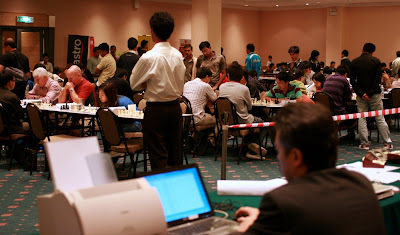 Meeting him in the last round is another Filipino GM Laylo Darwin. GM Sermek Drazen and GM Susanto Megaranto had a very short and quick 2 minutes draw at the start of Round 9, left the score sheets on the table and disappeared, leaving the arbiters wondering what had happened. FM Lim Yee Weng playing on Table 3 fought well against GM Li Shilong in Round 9, to take on GM Li Chao next. It augurs well for Malaysian chess to see a local player playing in the top board very late in this tournament. GM Li Chao remains in the lead with 7 1/2 points while FM Lim Yee Weng shares with GM Dzumaev Marat at 7 points.